AT PORTSMOUTH. A ship’s boat is seen in this photograph near H.M.S. Iron Duke during Navy Week. H.M.S. Iron Duke, formerly a battleship, is now a gunnery training ship. Her present displacement is 21,250 tons and she is 580 feet long. She has a beam of 90 feet and a depth of 32 feet. THERE are few Englishmen who have not heard of Navy Week - that increasingly popular annual event when the Royal Navy is “at home” to the British public. Since its inauguration in 1928 no fewer than 2,213,801 people have attended it. Navy Week had its origin in the “Trafalgar Orphan Fund Pageants”. These so-called pageants were started in 1920 by a Lower-Deck committee at Portsmouth with the approval of the Commander-in-Chief. Their object was to raise money for the fund, which was in low water because of the large number of naval orphans left by the war of 1914-18. The pageants were held annually until 1928, and consisted mainly of processions through the streets of Portsmouth of naval ratings - some in uniform, some in fancy dress - who rattled collecting boxes while drawing decorated lorries disguised to represent naval ships or weapons. These processions collected about £1,300 annually for the fund. The money was urgently required, but it was felt that such methods were scarcely in keeping with the traditions of the Service. Moreover there were other naval charities which required financial assistance. 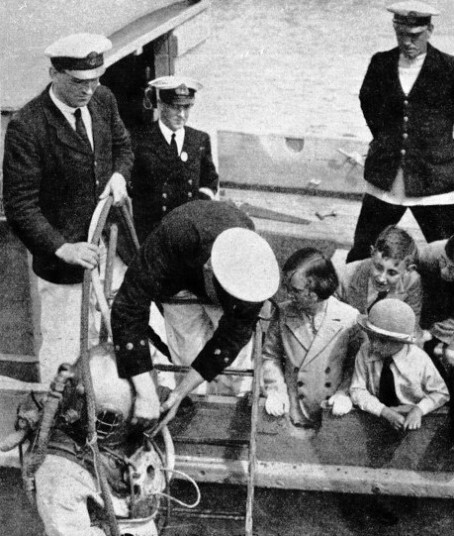 Early in 1927, therefore, a proposal was put forward, and approved by the Admiralty, to hold a voluntarily organized naval pageant in Portsmouth dockyard during the workmen’s holiday in August. The object of this first pageant week was to raise funds for naval charities, as did the Aldershot Tattoo for the Army and Hendon Air Display for the Royal Air Force. Despite bad weather the pageant week was such a success that Their Lordships authorized the holding of a “Naval Week” for 1928 This was held in the dockyards at Plymouth and Chatham as well as at Portsmouth. Since then this “Navy Week”, as it is now called, has been held annually at all three ports in August Bank Holiday week and the attendance of the public has grown from 198,258 in 1928 to 333,007 in 1935. There are two fundamental differences between Navy Week and the corresponding displays of the sister Services at Aldershot, Tidworth and Hendon. In the first place, Navy Week is a far more democratic institution in that it caters for everybody on an equal basis. The poorest man in the street is on exactly the same footing as the millionaire. The admission charge of only one shilling (sixpence for children under fourteen) includes everything except luncheons, teas and refreshments, which are obtainable at popular prices. The only exception to this rule is the innovation in 1936 of admitting soldiers and airmen in uniform at half price with a view to stimulating that necessary comradeship and co-operation of the three Defence Services. The second point of difference is that for the Army’s tattoos and for the Royal Air Force displays many months are spent in training the performers, whereas no rehearsals for Navy Week are possible. A day or so before Navy Week begins, however, there is one afternoon’s rehearsal of certain events for the benefit of the Press. The “arena” for Navy Week is the busy naval dockyard at each Home Port and for this reason it has always to take place during the first week of August, so as to coincide with the dock-yardmen’s annual holiday. Until half an hour before the dockyard gates are opened to the public at 12.30 p.m., and the day after Navy Week closes, this “arena” is a hive of industry, with thousands of workmen actively engaged in building and refitting His Majesty’s ships. Until the very end of July, moreover, the ships and most of the personnel taking part in the various displays are at sea with the Fleet engaged upon their “lawful occasions”. Despite the lack of rehearsals, Navy Week is produced with that customary swing which the landsman expects of his Navy. The secret of this lies in the fact that Navy Week depends chiefly for its popularity upon the representation of the everyday life and work of the Navy, rather than on a specially staged and rehearsed spectacular display. The chief object of Navy Week was originally to raise funds for naval charities, and still, every year, after the bare expenses of production have been paid, all the profits are allocated to these charities. The scope of Navy Week has now, however, been widened. It serves, in addition, to show the taxpayer that he is getting good value for his money and to educate the public to a realization of their dependence on the Royal Navy - for their prosperity in peace and for their existence in time of war. Further, the insight which Navy Week affords into the daily life and work of naval officers and men stimulates recruiting. In contrast to the Army and the Royal Air Force, naval personnel includes representatives of almost every trade and calling to be found on shore. Naval men welcome all visitors on board during Navy Week, explain the mysteries of their wonderful ships and tell them how they live and work. The prospective recruit is much impressed by the cleanliness of the living quarters and by the standard of food. He is still more impressed by the fact that the Navy affords a certain career. Every man can serve for twelve years; the greater majority earn a good life pension after twenty-two years’ service and have excellent qualifications for good civil employment on retirement. The British naval or ex-naval rating is known, respected and trusted all over the world. Until 1932 Navy Week was organized and produced entirely on a voluntary basis; there was no permanent staff not even a paid secretary. All the work was done by officers and men in their spare time, when they would otherwise have been on leave. In 1932, for the first time, the attendance numbers showed a decline. The reason was that nearly everyone in the vicinity of the three Home Ports had already been to one of the five preceding Navy Weeks, and the existing temporary organization did not encompass people who lived farther afield. Everything used in Navy Week, even the loan of Government stores and dockyard services, has to be paid for out of the admission fees, so that no expense in connexion with Navy Week ever falls on the taxpayer. It was found that the financial work entailed, with the allocation of profits to the many different naval charities, was becoming a fulltime business. In 1932, therefore, a retired officer of the Accountant Branch was given the salaried post of Secretary to the Navy Week Committee, and a publicity agent was employed at Portsmouth to advertise Navy Week. DURING NAVY WEEK the general public may visit ships of the Royal Navy and watch the ratings at gun drill and other forms of training. This photograph shows the crew of a 6-in. 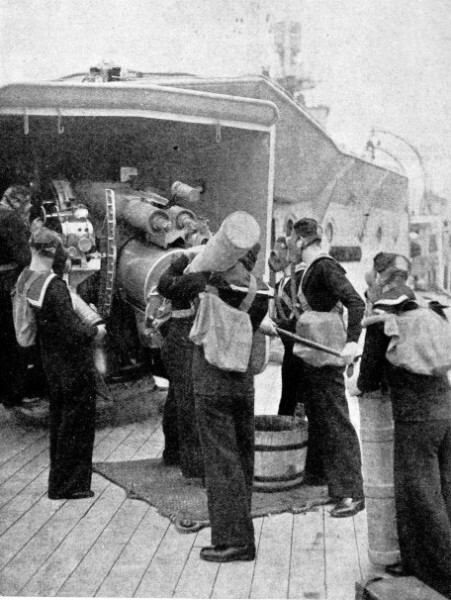 gun loading during a supposed gas attack. By 1934 the attendance figures were again rising. This was due to a wider distribution of publicity and to the establishment of contacts with the Press, the railways and commercial enterprises and ex-Service associations outside the Port areas. It was found that these first contacts with the outside world opened up a wide field for future development - particularly in the Midlands and North, whose inhabitants seldom saw and knew little or nothing of their Navy. A Flag Officer was therefore appointed to the Admiralty, to hold a watching brief over Navy Week activities and to consult the heads of civilian organizations with a view to making a report on recommendations for the organization and production of future Navy Weeks. At the same time a big London publicity firm was engaged to spread the news of Navy Week still farther afield. Admiralty Navy Week Liaison Officer (“A.N.W.L.O.”), with an office at the Admiralty - Commander G. A. B. Hills. Chatham: Navy Week Secretary, Lieut.-Commander J. R. Poland, with an office at the Royal Naval Barracks, Chatham. Plymouth: Navy Week Secretary, Lieut.-Commander R. B. Ford, with an office at the Royal Naval Barracks, Devonport. Portsmouth: Paymaster Captain H. C. F. Pinsent, the former Navy Week Secretary, to become General Secretary, with an office and an Assistant Secretary, at the Royal Naval Barracks, Portsmouth. Commander Poland retired in March 1936, on selection for the post of City Marshal of London, and was relieved as Navy Week Secretary, Chatham, by Commander H. R. Bennett. The Admiralty Navy Week Liaison Officer and the General Secretary at Portsmouth work for Navy Week as a whole. The Admiralty Navy Week Liaison Officer is charged with all publicity and acts as a, link with the Press, the B.B.C. and the civilian world generally. The General Secretary is in charge of the financial and secretarial work. The General Secretary and his assistant - a pensioned Chief Petty Officer Writer - act also as the organizing secretaries for the Portsmouth Navy Week Committee. The Navy Week Secretaries at Chatham and Plymouth are the organizing secretaries to the Navy Week Committees at those two ports; their services are part-time only as they are charged also with the “vocational training” for civil life of men about to be pensioned from the Service. Each Port Committee has as its chairman the Commodore in command of the Royal Naval Barracks. Each Committee consists of some twenty to thirty naval officers serving in ships or establishments of the Port command, with a representative of the Royal Marines and from the Home Fleet ships based on that port. They volunteer their services annually and, despite the strenuous duties of their Service appointments, undertake all the executive work of producing Navy Week in their spare time. At each port also hundreds of petty officers and men volunteer their spare-time services and play a major part in the production. A SEARCHLIGHT DISPLAY in the naval dockyard at Chatham. 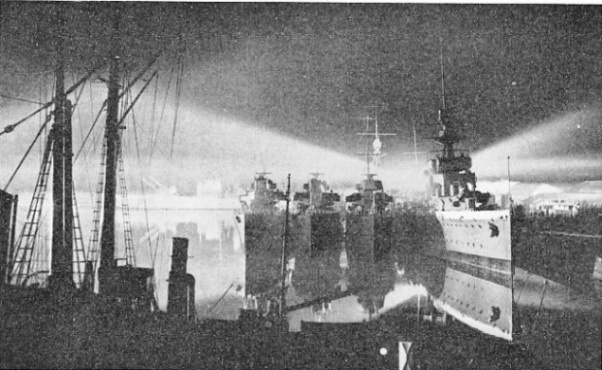 There is nothing more impressive than the sight of warships silhouetted or illuminated by powerful searchlights. This occasion, in August 1935, was the first time that the public had been admitted to Chatham Dockyard after dark during Navy Week. Few people realize the amount of work entailed by the organization and production of Navy Week. In its early days little was done beyond throwing open to the public the ships then lying in the port for their summer leave period. The few displays and demonstrations were those which required a minimum of preliminary organization. It is now necessary that Navy Week publicity should extend still more widely, so that those living in the Midlands, and even as far north as Scotland, may be enabled to see something of their Navy. Further, entirely new demonstrations have to be organized, so that those who have already been to Navy Week may come again and see more. Now, therefore, not only do the permanent staff have to start organizing next year’s Navy Week as soon as the last one is over, but also the volunteer committees are selected, and begin their work, in January, though the event does not take place until August. If Navy Week were organized on a commercial basis with advance bookings and reserved seats at, say, 10s. 6d. a head, and extra charges for the many separate displays and demonstrations, its production would be a comparatively simple task. But this is not the object. It is the wish and intention of the Committee to keep it equally accessible to every one regardless of his income. Hence every shilling spent on publicity, administration and production has to be most carefully considered. Navy Week is therefore largely dependent for publicity and support upon the patriotic efforts of private individuals and commercial and public undertakings all over the country. These range from the retired naval officer and country parson living in out-of-the-way districts to associations of ex-Service men and public services and commercial undertakings of every kind. The willing co-operation of the Press - both national and provincial - is of the greatest assistance. The big railway and road transport services are, of course, willing to help. This support is not, however obtained without the making of many personal contacts. Navy Week is being held in 1936 - at Portsmouth, Plymouth and Chatham - on Saturday, August 1, and from Monday, August 3 (Bank Holiday Monday), to Saturday, August 8, inclusive. There is the always popular inspection of His Majesty’s ships of all classes from submarines to 35,000 tons battleships. The more popular features of former years are retained, such as a “Q ship” in action with a submarine, turret gun drill, torpedo and depth-charge firing by destroyers and the everyday routine of a man-o’-war. 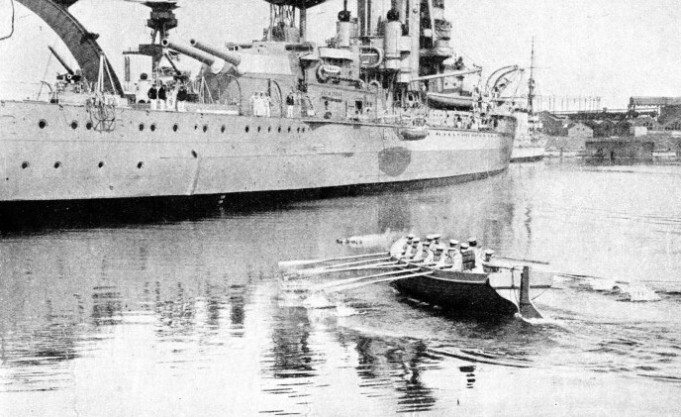 In addition many new demonstrations and displays have been organized, including spectacular and realistic displays showing a modern warship in action with real torpedo-bomber planes of the Fleet Air Arm, a demonstration of the counter measures taken by the crew of a warship and armed landing parties to meet a gas attack, and steam tactics of a fleet at sea demonstrated by the new naval “speed boats”. At Portsmouth there will be also a series of most interesting tableaux, by naval men in the uniform of the period, of famous naval landing parties - such as the Naval Brigade at Ladysmith during the Boer War. In a “theatre” at each port lucid and interesting demonstrations will be staged, with the help of moving models, accompanied by a running commentary and cinema projection, of four famous sea fights of the war of 1914-18. These are the Coronel and Falkland Islands actions, at Portsmouth; the Battle of Jutland, at Plymouth; and the Blocking of Zeebrugge, at Chatham. Navy Week is a typically British institution. That its objects, ideals and administration are admired all over the world will be realized when it is recalled that in 1934 six German naval officers, and in 1935 two Japanese naval officers, were especially sent to Great Britain to study British methods and see their results. Germany then produced her first Marine-Volkswoche (“People’s Navy Week”) at Kiel, in June 1935. Even the United States of America, with her annual “Navy Day” and her remarkably popular naval films, realizes that she can learn from Great Britain and is making inquiries. Some of the British Dominions and Colonies, whose people realize their dependence on the Navy more than is done in Great Britain, now have their own Navy Weeks. Navy Week is generally regarded as the best shilling’s worth of popular and instructive entertainment in the world. It appeals to the hearts of British subjects as does no other similar event. No matter what his status or calling, the visitor knows he will be welcomed; in-bred in him is the feeling that the whole history of his country and Empire has ever been bound to that of the sea and the Royal Navy. AN INTERESTING DISPLAY given to some children during Navy Week at Chatham. A diver descends from a boat and the methods employed and the diving apparatus used are fully explained to the onlookers. You can read more on “In the Royal Navy”, “The Navy Goes to Work” and “The Royal Naval Volunteer Reserve” on this website.